The more than 300 species of birds around the world that comprise the order Psittaciformes are known as parrots. Macaws, lorikeets, parakeets and cockatoos fall under this category. The overwhelming majority of parrots live in rain forests. Habitat destruction and illegal trade to satisfy a demanding pet market have put several parrot species in danger of extinction. Parrots are famous for an exuberantly colorful plumage that spans the rainbow. Exceptions include the African gray parrot, whose only pop of color is its red tail, and Pesquet's parrot, which is mostly black with areas of crimson plumage. Parrots have two toes that point forward and another two that point backward, a feature known as zygodactyl feet. Their beaks are strong and curved. 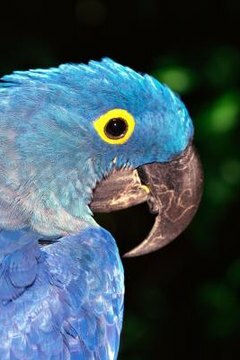 Their sizes range from the endangered hyacinth macaw, the largest species with a length of about 40 inches, to the six pygmy parrot species of the genus Micropsitta, which measure less than 4 inches. The heaviest parrot is the critically endangered kakapo, which weighs more than 6 pounds. It is the only parrot incapable of flight. The 17 macaw species live in the rain forests of Central and South America. The 31 species of Amazon parrots -- predominantly green birds between 10 and 16 inches long -- inhabit rain forests from Mexico to northern South America and on several Caribbean islands. Pygmy parrots, as well as the kakapo, are found only in New Zealand and neighboring islands. Pesquet's parrot is native to New Guinea. Australia has more than 56 parrot species, many of which dwell in rain forests. Endemic species include the Australia king parrot and the eclectus parrot. Only five of Australia's parrot species occur elsewhere on Earth, according to the Australia Zoo. A parrot's meal often consists of nuts or seeds, which the birds are able to grip with their zygodactyl feet and crack open using their strong beaks. Parrots in the rain forest also feed on fruits, buds, nectar and even insects. Some parrot species, particularly those in the Amazon rain forest, gather by the hundreds to eat mineral-rich clay that neutralizes toxins found in certain types of fruit they consume. Pygmy parrots also eat fungi. Parrots in the rain forest live in flocks called "companies" or "pandemoniums." They are prized as pets largely for their ability to mimic sounds, which is observed almost exclusively in captivity. The African gray parrot is capable of reproducing more than 700 sounds. In the wild, parrots communicate through screams and screeches that are used as playful gestures or to demarcate territory. Vocalizations are also used to attract mates. Many parrot species are monogamous and both parents look after the offspring. What Are the Advantages & Disadvantages of Bright Colors for a Parrot?